Back before I ever learned to knit, I spent my first winter in Alaska in a small, Park Service cabin in Denali Park. 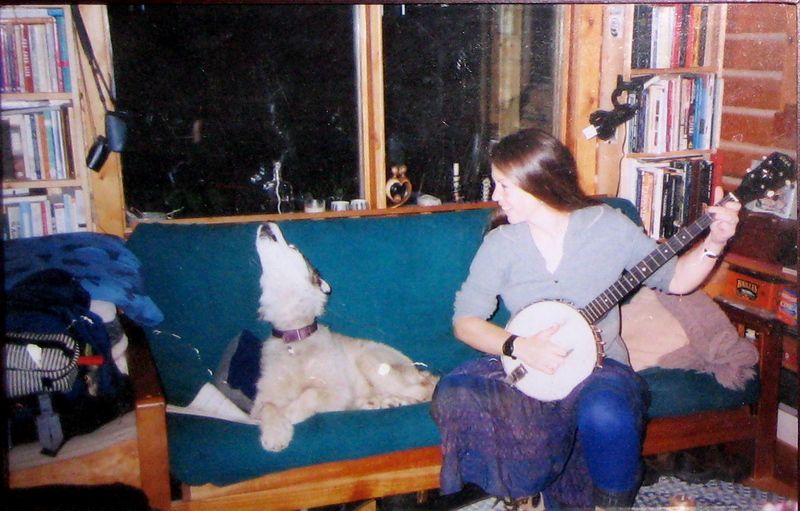 Quinn-dog loved to sing along every time I played banjo... at least, I think he loved it. If you’re living alone in the middle of the frozen tundra, a banjo is a great thing to have. It’s cheerful, helps pass the time, and being alone, you don’t have to feel bad practicing your frailing technique over & over on the same three chords. 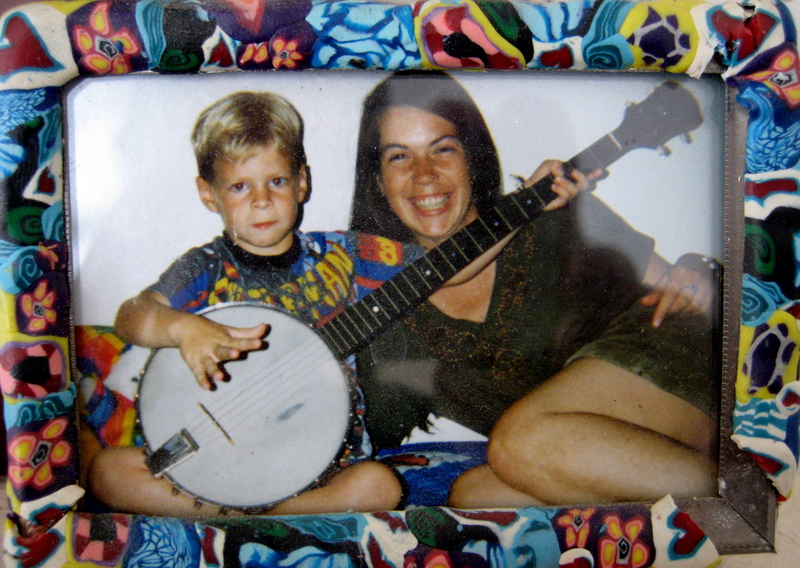 My nephew, Chad's first old time banjo lesson, 1996. But last June, I went to Miles of Music Camp on Lake Winnepesaukee, and fell in love with my banjo all over again. After 16 years, I’m still just a beginner, but I love me some old time banjo! This entry was posted in Music, Travel and tagged banjo, camp, clawhammer, Miles of Music, Quinn by Carrie Cahill Mulligan. Bookmark the permalink. No one should be ashamed of playing the banjo! I wish I could play but I just picked up the ukulele and the violin so the banjo will have to wait awhile. Great playing, you do not sound like a beginner! You’re picking up 2 new instruments?? Good for you, Kat! Thanks for the encouragement… I always feel like I should be further along, but it doesn’t diminish my enjoyment. Banjo is such a happy instrument! It does get an undeserved bad rap. 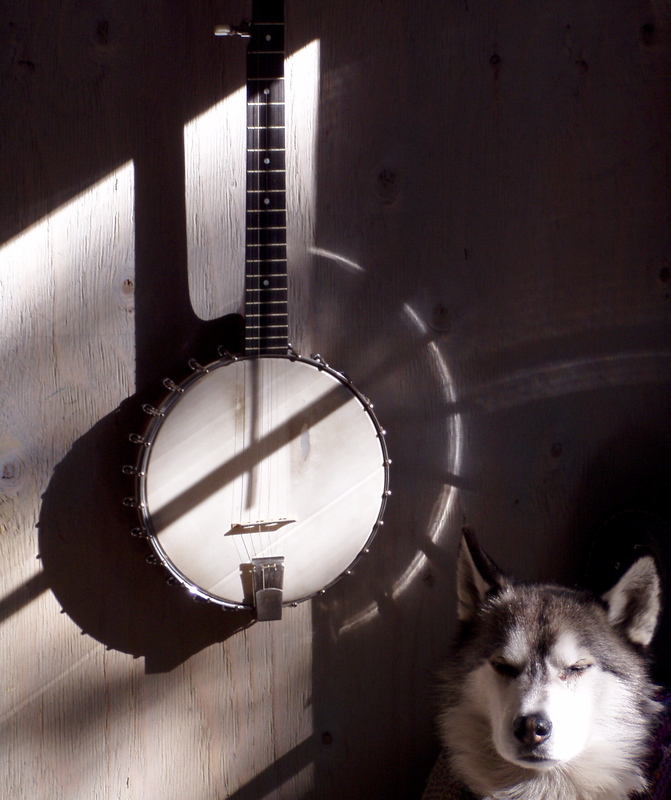 My favorite is the photo of Quinn-dog & my banjo in the sun. I had some postage stamps made with that once. It always makes me smile. Glad that I found your blog. Keep on picking!